Ever wanted to have an automatic email sent to gallery visitors prior to the event expiration? Now you can…automatic email schedules can be created to email the future ‘Gallery Visitors’ and/or subsets of the visitors to your Events! 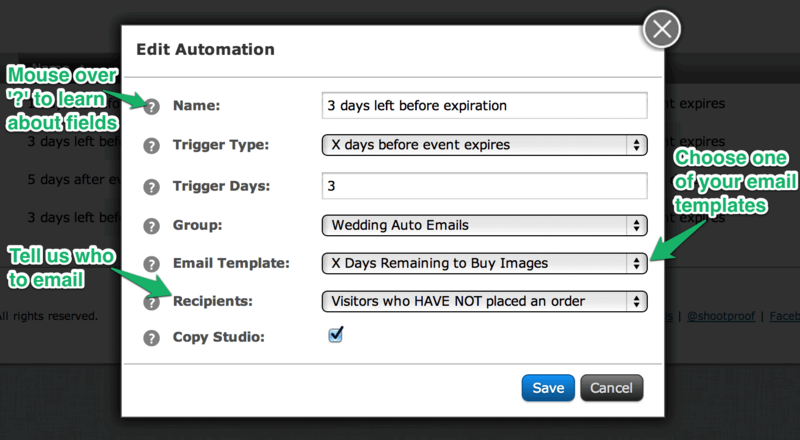 As an example, you can define the days prior to expiration when building an email automation schedule and ShootProof will handle sending out the email to remind them so you can get more eyeballs back to the photos for additional sales. You first need to ensure that you have created Email Templates – then automated emails can be set up based on the templates. When: Notice the “Trigger Type” and “Trigger Days” fields below. An email can be scheduled to be sent automatically to gallery visitors X days prior to the Expiration Date of the Event or X days following the Event Date as a reminder to view/purchase photos. What: The “Email Template” field below tells ShootProof what content to email the visitors. Who: See “Recipients” field below. You can define which future gallery visitors will receive this specific automatic email, e.g. all gallery visitors, only visitors with favorites or un-purchased items in their cart, only visitors that have not made a purchase, etc. Step #3 – On the Settings screen for any Event you will find the option to select a ‘Group’ of Automated Emails to be sent for the Event. We believe the new email automation tool will help to save you time and drive more traffic back to your client galleries!